"American society has become more libertarian because, more than any other country on the planet, it has successfully adapted to the novel conditions of economic abundance. And because of the way this adaptation took place, a broadly defined libertarianism now occupies the center of the American political spectrum." This theme is explored more broadly in Lindsey's recent book The Age of Abundance (a book I have yet to read, but have queued up for my next Amazon order) and inspired the masthead and headline for the monthly Cato Unbound theme. Others around the blogosphere are debating the merits of his basic thesis, including Atlantician Matthew Yglesias , Michael van der Galiën and Angry Blogger Brian Moore. I am more interested in exploring a secondary theme in Lindsey's essay, libertarian political impotence and what to do about it. "There is no organized libertarian movement of any significance in American politics. To be sure, libertarian academics and intellectuals occupy some prominent positions and exert real influence on the public debate. But they do not speak on behalf of any politically mobilized mass constituency. Only about 2 percent of Americans describe themselves as libertarian, according to a 2000 Rasmussen poll. And the Libertarian Party is a fringe operation that, at best, occasionally plays the spoiler...."
"There are some obvious objections to the idea of a libertarian center. First, as I stated at the outset, there is no libertarian political movement to speak of. Accordingly, there is no organized libertarian-leaning constituency that could ally with either conservatives or liberals to alter the balance of power. Rather, at best libertarianism exists as a diffuse, inchoate set of impulses that operate, not as an independent force, but as tendencies within the left and right and a check on how far each can stray in illiberal directions." "I hope that nothing in this essay has conveyed even a hint of libertarian triumphalism. That would be just plain silly, as even the rosiest of tinted glasses cannot hide Leviathan’s many and egregious blunders and injustices. And in all too many cases, the foreseeable prospects for remedying those blunders and injustices are dim to nonexistent." " ...conflict is still with us today, in the form of the polarized politics of Red America vs. Blue America. The good news, though, is that this polarization mostly concerns minorities of true believers and their media talking heads rather the bulk of ordinary Americans. Most Americans, it turns out, have moved on since the ’60s toward a common ground whose coloration is not recognizably red or blue – call it a purplish, libertarianish centrism." Fine and good, but the problem occurs when we try to quantify these purplish, libertarianish centrishts as a predictable voting block. Shortly before the mid-terms, the Cato Institute published a prescient policy analysis by David Boaz and Divid Kirby that documents the existence of a libertarian swing vote, predicted the outcome of the midterms based on trends in that block, and (as long as we are little fuzzy about the definition of these "libertarianish voters") quantifies the potential size of the libertarianish block as 9-13% of the vote. Ignoring the actual size of the libertarianish center, lets just stipulate Lindsey's whole argument and agree that it exists. A number of questions are left begging: If there is a vibrant growing "libertarian center", why does it not translate into a recognizable, self-aware political constituency? Why do libertarian ideas "exert real influence on the public debate" but remain "a diffuse, inchoate set of impulses" with "no libertarian political movement to speak of"? Lets get back to basics. Libertarian ideas have intellectual power. But simply sharing common ideas and values (good or bad) while a necessary condition, is not sufficient for a constituency to wield political power. Political power is never granted to a constituency just because they have good ideas. Political power is earned when a constituency can be shown to vote in a predictable way. Predictable voting blocks can organize themselves around a party, a personality, or a specific issue. The operative word is organize. As Lindsey points out, the Libertarian Party has failed as a vehicle to organize the libertarian center into a meaningful voting block and is, as a result, relegated to a "fringe operation." 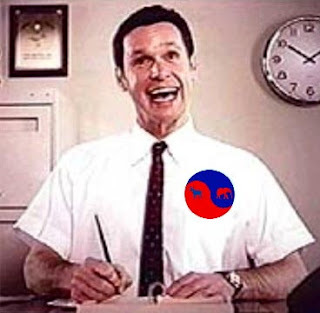 Constituencies can also organize around personalities (Wallace, Perot, Nader et.al.) and these "cults of personality" can indeed secure some political clout, even if it is temporally limited until such time a major party sufficiently panders and co-opts their base. The best that libertarians have been able to muster as an organizing "cult of personality" is Ron Paul, which um... seems a bit self limiting. Constituencies that have organized around single issues (abortion, gay rights, war) have wielded real voting power. Problem being, that to a large degree these issues are already "owned" by one major party or the other. Rationalizing drug policy qualifies as a single issue championed primarily by libertarians, but does not, as yet, seem to be a sufficiently important issue to the electorate to attract and organize real political power. If it does, it will certainly be subsumed by one party or the other, and lost as an organizing principle for libertarians and the libertarian leaning. So what and where is the organizing principle for a libertarian voting block? "Libertarian organization is going to have to look different than traditional politics, after all, it is something we will have to be able to accomplish while sitting in the hot-tub. What is needed, is an organizing principle. Ideally, a principle that is so obvious, so logical, and so clear-cut, that no leadership is needed, no parties are needed, no candidates are needed, and no infrastructure is needed. Ideally it is this easy: You think about the principle, and you know how to vote. That organizing principle exists. 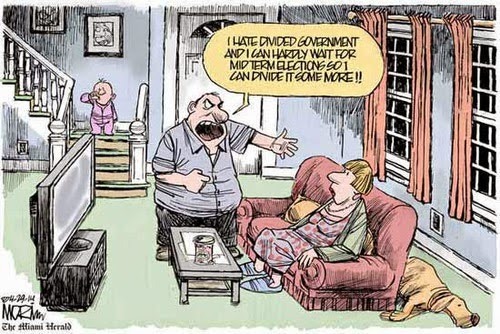 It is Divided Government. It is absolutely clear-cut and easy to understand. Divided Government is documented by Niskanen et.al. to work in a practical real-world manner to restrain the growth of the state. As a voting strategy it can be implemented immediately. More importantly, it can collectively be implemented individually as we sit in our hot tubs and ponder the sorry state of the world. 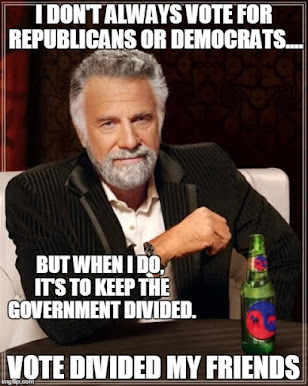 Whatever the percentage of the electorate that libertarians represent, whether it is 9% or 20%, if they vote as a block for divided government, they immediately become the brokers of an evenly split partisan electorate. They arguably become the single most most potent voting block in the country, specifically because they are willing to vote either Democratic or Republican as a block. Specifically because they are not fused to one party or the other. When I wrote that, I was advocating a straight Democratic ticket vote on the federal level to break single party Republican control in the 2006 mid-terms. This blog was one of many "libertarian leaning" voices to call for that divided government vote, including, Jacob Sullum, Jon Henke, Stephen Slivinski, Ron Bailey, Nick Gillespie, Doug Bandow, Warren Meyer, Alex Knapp, Bruce McQuain, Bruce Bartlett, Jane Galt and, of course, the godfather of Divided Government politics - William Niskanen. I could go on, there were plenty more. That drumbeat beget mainstream media attention, like here, here, here and here. And... It worked. Even better, our shiny new divided government is delivering on exactly the libertarian objectives that we hoped it would. Unlike Brink Lindsey, I'm practically giddy with optimism. If it worked once, it can work twice. As clear as it was in 2006 that the only way to secure divided government was voting Democratic, it is just as clear that the only way to maintain divided government in 2009 is to elect a Republican president in 2008. So that is the plan. We just need libertarians to get back on the bandwagon and start beating the divided government drum again. "The idea of a libertarian center is about the core of American political culture, not the margins of political change. What I’m saying is that partisans on both sides need to recraft their messages and programs to better reflect the entrepreneurial, tolerant spirit of contemporary America." ...will happen sooner rather than later. Shaping an election outcome one time can be dismissed as a rogue political wave. Shaping two consecutive federal elections is a sea change that cannot be ignored. If the libertarian "divided government vote" is shown to swing the 2008 presidential election as it did the Congressional outcome in 2006, then libertarians will no longer be inchoate, their message no longer diffused, and their political clout no longer flaccid. As long as the bulk of the electorate remain polarized and balanced, even a small percentage libertarian swing vote organized around divided government will be enough for libertarians to display the biggest swinging political "hammer" in town. Technorati tags: divided government, libertarian, Cato Institue,2008 election, , Republican, Democrat. You say, "As clear as it was in 2006 that the only way to secure divided government was voting Democratic, it is just as clear that the only way to maintain divided government in 2009 is to elect a Republican president in 2008. So that is the plan. We just need libertarians to get back on the bandwagon and start beating the divided government drum again." As important to the concept of limited government as divided government is, it is so only because anything else is a disaster, not because it is ideal. Most important, however, is that after the example of George W. Bush voting party line instead of candidate should be unthinkable. First, I am not advocating a party line vote. I am perfectly happy with a Democratic House of Representatives and will vote for my Democratic Representative Nancy Pelosi. I have no senate vote in CA this time around, but the Dems cannot lose the Senate. There are 33 Senate seats contested in 2008. Of these, 21 are held by Republicans and 12 by Democrats. Simple numbers - the Republicans have a lot more at risk, and will be playing defense. The Democrats have many more opportunities to take seats than Republicans. Advantage Democrats. Big Big advantage. In the 100 years since we have been directly electing Senators, the House has never flipped majority unless the Senate did also. Never. Not even once. So we are staring at a single party Democratic controlled government in 2009 if the Dems take the White House. We know for historical fact where single party government leads. Far more spending. Far more government. Far less oversight. Far more corruption. Much worse legislation, undermined checks/balances and erosion of constitutional protection of individual rights. It happens every time without exception regardless of party. Republican vs. Democrat is a false choice. Single party controlled government vs. Divided government is the real choice. I am voting for objectives. Those objectives can only be met by electing a Republican (or independent) president in 2008. I'd encourage anyone who agrees with this formulation to register Republican now, so that we can have the best opportunity to nominate a Republican with integrity, like oh, I dunno - Chuck Hagel or Ron Paul. BTW Ashley, apparently you were not aware of this, but George W Bush is not running for President in 2008. Hopefully that will enable you to separate the man from the office, and vote for better government, by voting for divided government. You have completely missed the point. Of course GWB is not running in 2008. The point is that by insisting that divided goverment is more important than anything else, you risk the possibility of another presidential disaster. You guys ... a Presidential disaster is a GOOD THING, just as a Congressional disaster is a GOOD THING. Quit worshipping successful and efficient government. We need government failure in every respect. I would say rather than strive for divided and balanced, strive for electing the stupidest most prone to failure. Thanks for stopping by and thanks for the comment. I don't have the slightest idea WTF you are talking about. I mean that in the nicest possible way. * Restrained growth of spending. * Less likelihood of war. * More carefully considered major legislation. * Reinforced rather than undermined Checks and Balances between the branches. when you have divided government vs. a single party control of the legislature and the executive. Fact. That is what I am voting for, and that is what I get. That is what we got when we had a Democrat President (Clinton) with a Republican Congress. That is what we are getting now with a Republican President and a Democratic congress. It just works better that way. You, on the other hand, have apparently decided that Republicans are evil and Democrats are good. That's fine. That is how partisans on both sides think. I don't think that way. I think they are fundamentally the same, just different lobbyists. That's also ok. but the only way to keep their worst impulses in check, is not give either party all the keys. The fact is, that Murtha(D) is as big a crook as Hastert(R). Our government was designed to have branches in opposition. Different parties in control of the executive and legislature keeps it working the way it was designed. I get exactly what I vote for, and I don't have to trust what the politicians say to get it. You are voting for what politicians say to get your vote. And it is very unlikely that you will get what you vote for, even - perhaps especially - if you win. when are you going to comment on this ? Hmmm. Thanks anon. I completely missed it. Getting too wrapped up in the British Open (Sergio and Padraig in a playoff now). I do x-post on Kos occasionally. Problem being - with Kos - after a day late and 500 comments behind - there is no point on commenting on Hunters post now. Maybe I'll respond with a diary later. mw -- As a centrist, I couldn't agree with you more that in '08 a Republican president will be necessary to keep the Dem-controlled Congress from swinging the political pendulum way too far the other way - in fact I did recently switch my political affiliation (temporarily) from Libertarian to Republican. I also agree that we in the middle need to keep the two major parties honest by punishing stupidity, corruption, etc. with our votes. But why not take things a step further and create a party that will keep them honest on a real-time basis in Congress? As I argue in my embryonic blog, http://centristpartynow.blogspot.com, what we need is a party based on principles -- not issues. Just as neither Democrat or Republican voters are as monolithic as many seem to believe, I think there are few individual political issues that will truly unite and inspire all centrists. However, a party based on the best qualities of statesmen such as Hagel, McCain, and even Obama could at least garner enough support to become a force in Congress fighting for people that desperately want better accountability, more common sense and inclusiveness, and less underhanded fighting for power's sake from our government.